Abstract: ....or: The story about IObject and IElement. It is rather easy to find ECO Objects in the ECO Space using ExpressionHandles. It is even easier when using WinForms applications and bind the result to a DataGrid or any other visual control. The developer does not need to handle any objects as the result of the expression is shown in the visual control immediately. The thing I never understood at first is the fact why "IElement"? Sometimes you see examples on the internet that list "IObject". The reason for that is easy. Having a look at the next class diagram you can see the meaning that IElement has. IElement is an interface that is never used directly, but other interfaces derive from it. Two of these are the sub-interfaces named IObject and IPrimitive. This makes it very clear that it will fail sometimes when you cast the return type of Evaluate to IObject all the time. 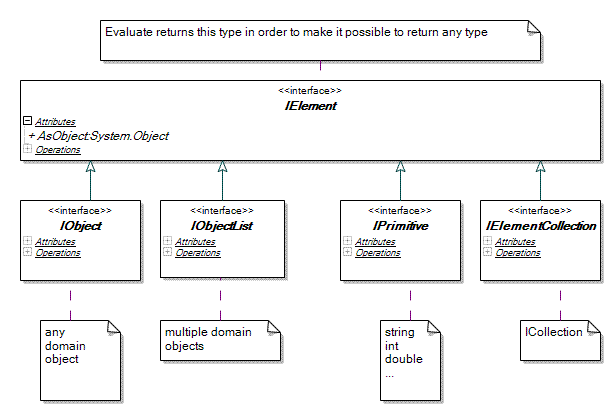 In this very article I will show you how to distinguish between IPrimitive and IObject. That single statement alone is not safe though. You need to check myContent for "null" after casting! The question I had reading that was: "myResultB might be null, too!?". My answer to that is simply "No.". The ECO developers made sure that "myResultB" in that case always is not equal to null, so that you can check "AsObject". After that you will have not have to check myInt if it is equal to null before you use it. ECO makes sure that if there is no matching instance, the value of myInt will simply be "0". Considering that "select(false)" never will select any instance, "first.title" would trigger an exception if it would be "null" or something similar. The ECO developers took the easy route and made sure that this expression will evaluate just fine and you can handle the return type accordingly. You do not have to think about the fact that your OCL might become "null" (or some OCL-equivalent) at any position. Then we can get a reference to all the objects returned using a foreach loop, e.g. That would give us IObject-s, which we can transform to our own types as above. This requires a cast as above using the AsObject-property. You might have noticed that I do not check for "null". This is not necessary, because the loop will simply never be entered if the result set is empty. Furthermore, you can use the "Count" property of IObjectList if you need to know the number of objects that have been returned. You might have guessed by now, that if there are no entries retrieved by the expression being used, the collection "myCollection" will simply be empty, but you will not have to watch out for "null" at any point using the code above. Use "myCollection.Count>0" to check if there has been at least one return value. The items of this collection are of the type in the ".NET World" you are interested in, "int" in this case. Thus, you can cast every item of "myCollection" to "int" to retrieve your results. The following schema sums up everything you have seen in this section. It might be quite handy when starting to use the OclService in code. As you know, the result of an OCL query depends on the context it is being executed in all the time. The term "context" is sometimes a little bit difficult to understand. You might also define the context in ECO as the "starting point" or "root node" (depending on how you imagine a model in your mind). I will give you a very basic example. The model used in this article has a class named "Content". If I set the context to no element of the ECO Space in particular, I can execute statements like "Content.allInstances->select(...)" e.g. However, I cannot get the associated category of one specific instance of Content. For that to work, I have to set the context of the OCL Service to the Content Object as the starting point of executing. Then I can simply state "self.Category" and I will get one or multiple results, depending on the association in place between Content and Category. Take note of the fact that the first parameter has to be an object in the "ECO World". In case you only have an object handy from the .NET World, e.g. 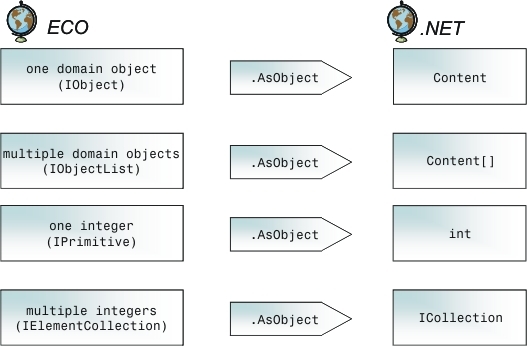 an instance of Content as shown in the example, use the AsIObject method. You may think of "AsIObject" as the inverse of "AsObject". It allows you to step from the ".NET World" into the "ECO World". Holger Flick, born and living in Germany, studies Computer Science at the University of Dortmund, Germany. His major subjects at University include Logical Systems, Computer Networks and Distributed Systems, Information Systems, Artificial Intelligence (esp. data mining with focus on Knowledge Discovery in Databases and Modeling), Systems Analysis and Evolutionary Computation. He will graduate with diploma later this year as he writes his thesis at the Chair for Artificial Intelligence at the moment. Next to his work at University his major interest is Borland's ECO, which helped him develop client as well as web applications. At the moment, he works on a web site that is administrated using a Content Management System in connection with an ECO ASP.NET application. Olaf triggered my interest in uncovering the internals about IElement and IObject. Alois wrote and published the first book that covers ECO III in detail. It is available in German and in English on his website http://www.ecospace.de.